But for some reason when I load the results, the layers contain no objects (specifically, the Min and Max Principal Stresses). I noticed that you imported some additional information (CL elements and nodes, among other things). Is there a trick to having the principal stresses come in as vectors (lines) that we can then reference in gh? I am a little confused by your wording of "unsigned magnitude to generate the lines representing the principal stress vector feild"
If you can elaborate on that step, I would really appreciate it. I was wondering if there is a way that the stress values at the nodes of the false colour meshes can be accessed in Grasshopper? Perhaps using UTO's add attributes component or something like that? I want to use the stress values at the nodes to drive material distribution. Right now I'm using the lengths of the principal stress crvs to drive the distribution but it would be nice to be able to use the values from the analysis meshes. Any help or suggestions would be greatly apreciated. Thanks for the suggestion. I just added a grasshopper component to StructDrawRhino to take a mesh, and a value for each vertex and it can produce a false color mesh. Does this help? I posted an example just before on the blog. 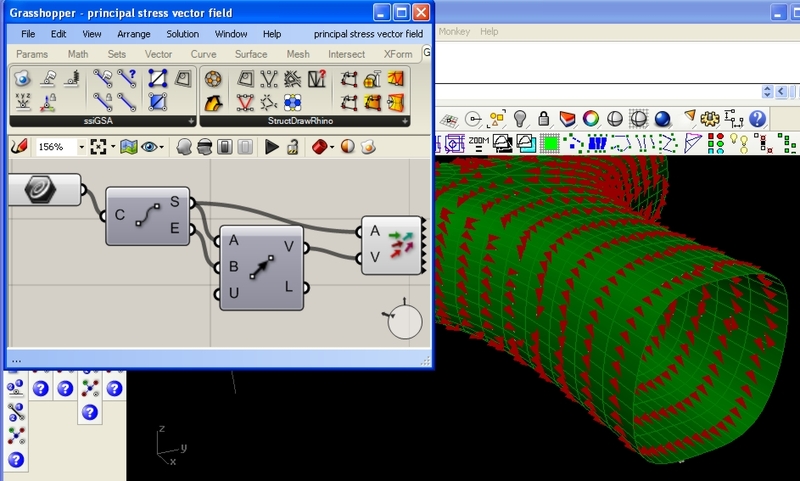 There are better ways to do this now in Grasshopper than the method shown in this older blog post. 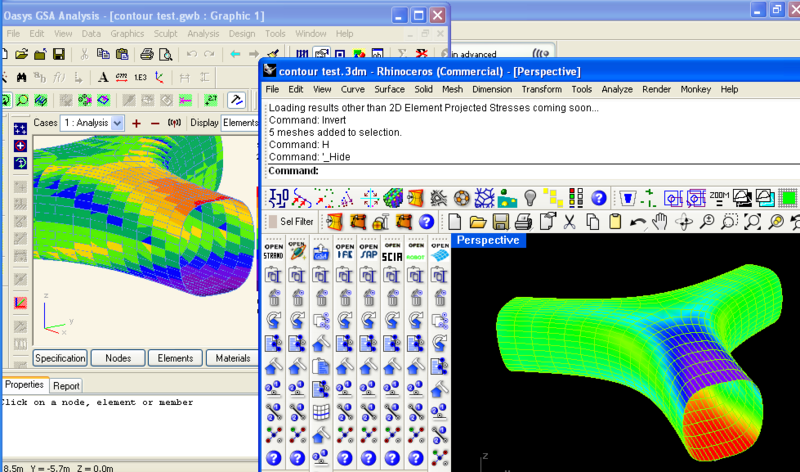 Are you extracting the result from GSA analysis as I have already provided components to extract 2d element stress. If you're using a different analysis program or having difficulty, email me know and I'll assist with applying this. Yes I'm extracting the result from GSA analysis as per your tutorial above, I'm just not sure how I would go about getting the stress values at each node into a list in grasshopper, ie the Von Mise stress at each node. Is there some way to read it directly from the coloured mesh? Would the component your referring to be the "SSI Query Derived Stress" component? Would the analysis have to be conducted within grasshopper to use that component? Or is there someway to get the derived stresses into grasshopper after importing the results from the text file as per your video above? Thanks so much for your help Jon, I really appreciate it. is there a way to do the same with 1D element model (beams and columns)?